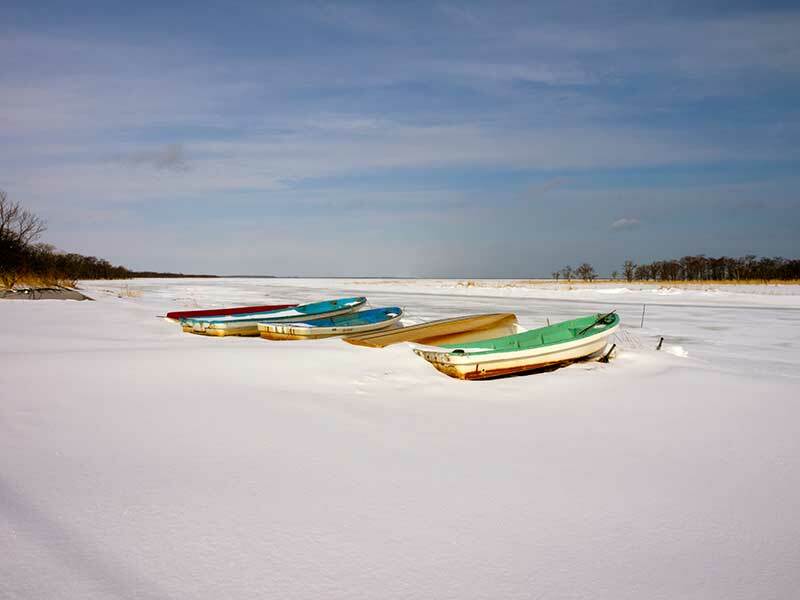 A tour through East Hokkaido's wonderful landscape set deep in winter. 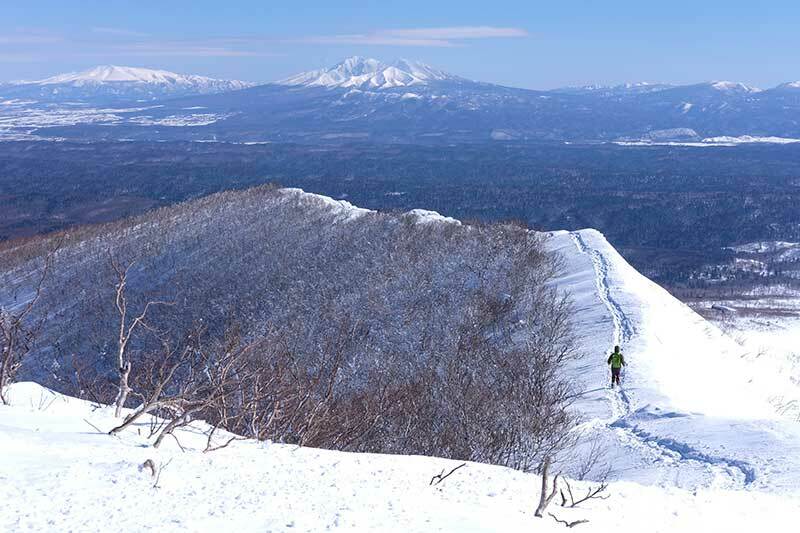 Guided walking and snowshoeing in Hokkaido’s less-visited, snowy eastern region; walk over pristine snow, spot abundant wildlife and survey crater lakes shimmering in the crystal-clear air; delightful accommodation with onsen hot spring baths. 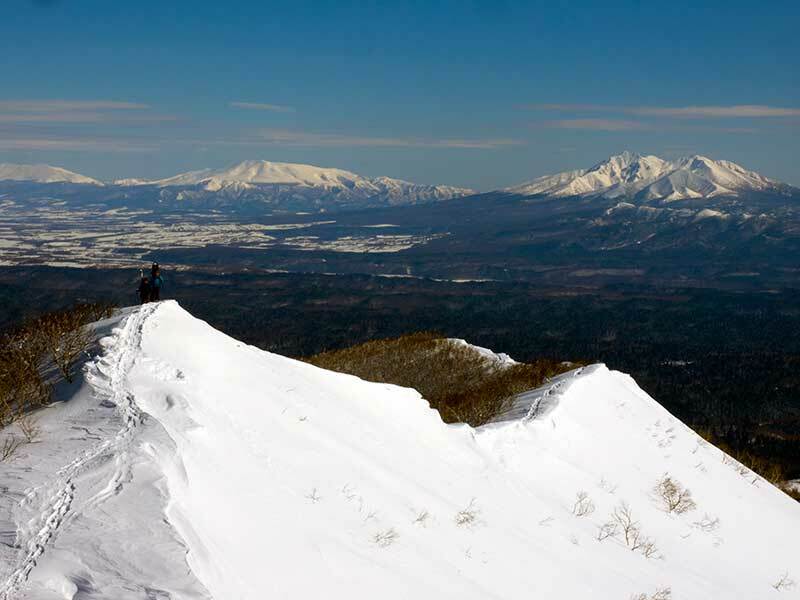 The Hokkaido Snow Tour is a fully guided tour suitable for anyone who is an occasional walker and can walk for more than three to four hours in comfort. We walk and use snowshoes to follow the tour route, which is over snow-covered, flat or gently inclined terrain, with some steeper climbs. Please read more on Tour Levels here. 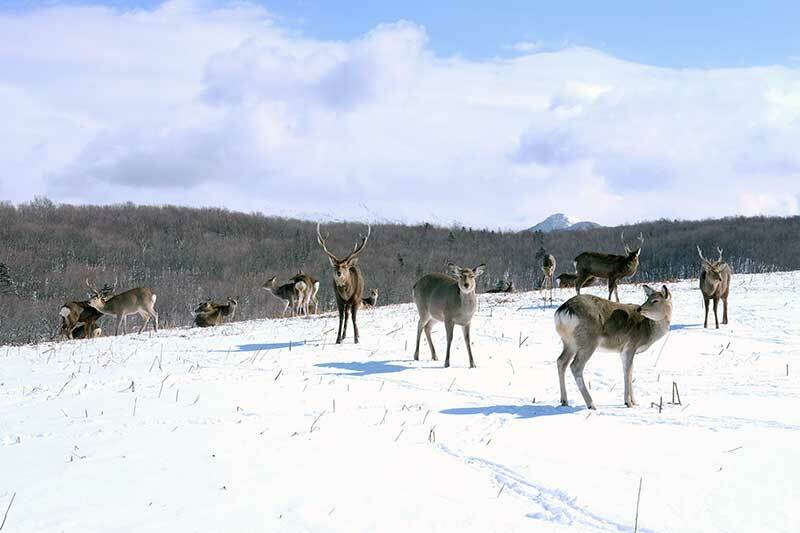 An 8-day, 7-night tour starting in Kushiro and finishing in Memanbetsu Airport. Tour accommodation is in hotels and Japanese inns. The maximum group size for this tour is 12 persons. We have no minimum size. If we accept a booking we guarantee to run the tour. 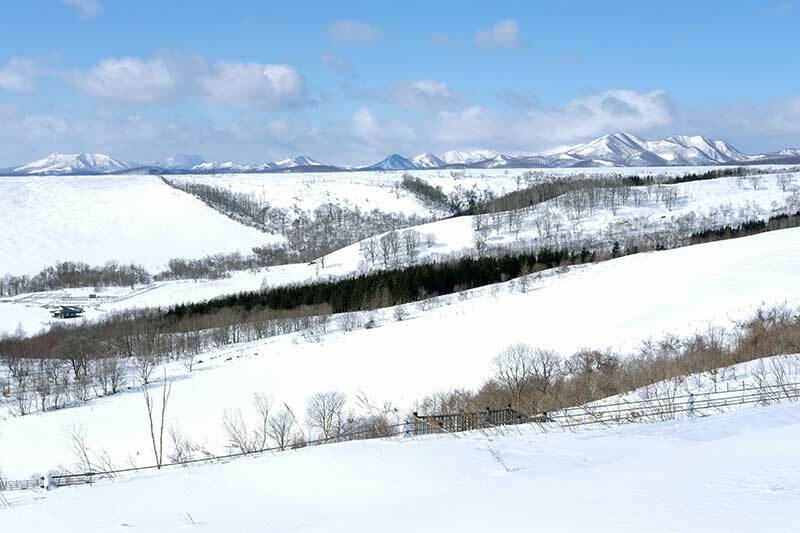 The Hokkaido Snow Tour is a fully guided tour exploring the little-visited and sparsely inhabited region of eastern Hokkaido. Here we are a long way from Hokkaido’s acclaimed ski resorts centred in the west of the island, the most northerly in Japan. 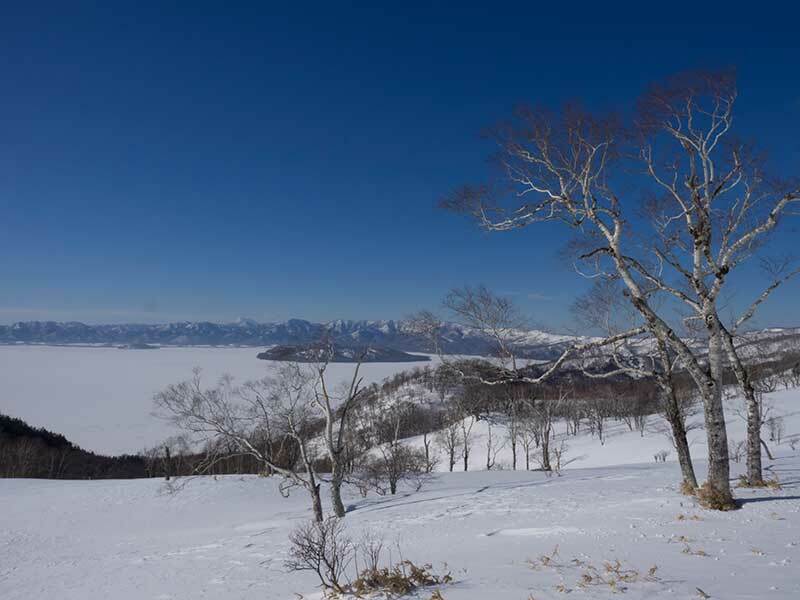 However, the same quality, powder snow that makes Hokkaido a skiing mecca also falls on east Hokkaido’s wide-open flatlands, dramatically abutted by mountain ranges, the Pacific Ocean and the Sea of Okhotsk. A beautiful, perfect winter environment for us to explore. 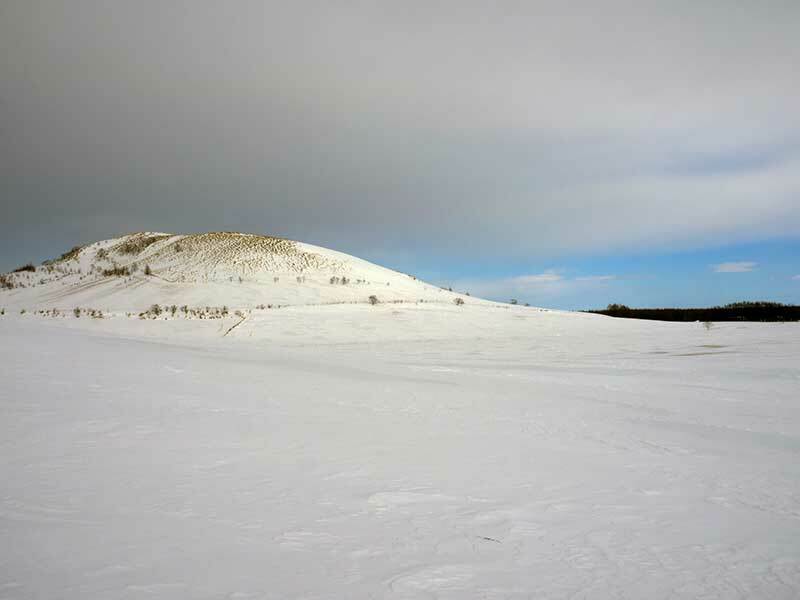 Snow falls copiously during the winter months in Hokkaido and turns the lush green expanses of east Hokkaido’s rolling meadows and wetlands, which we explore on our East Hokkaido Walk tour, into a pristine winter landscape. 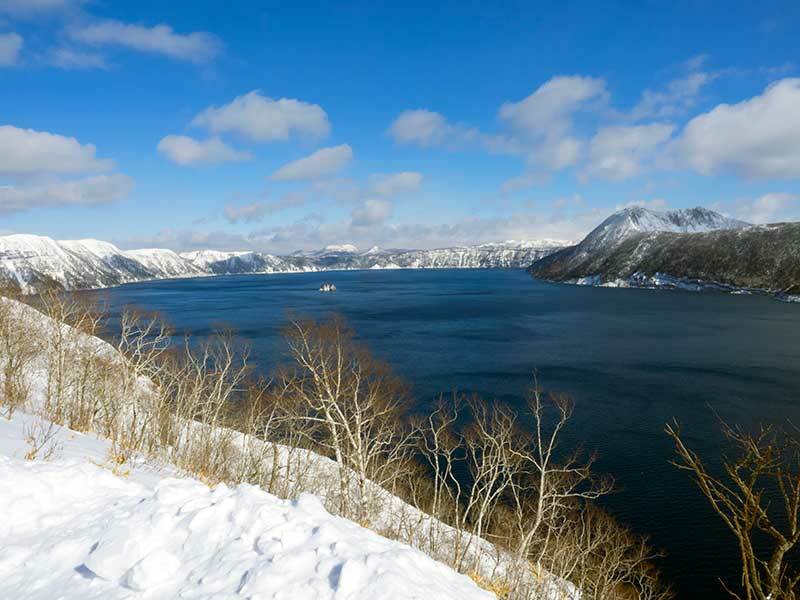 Hokkaido is Japan’s newest territory, a land that retains a distant, frontier feeling. Few visitors come this far. 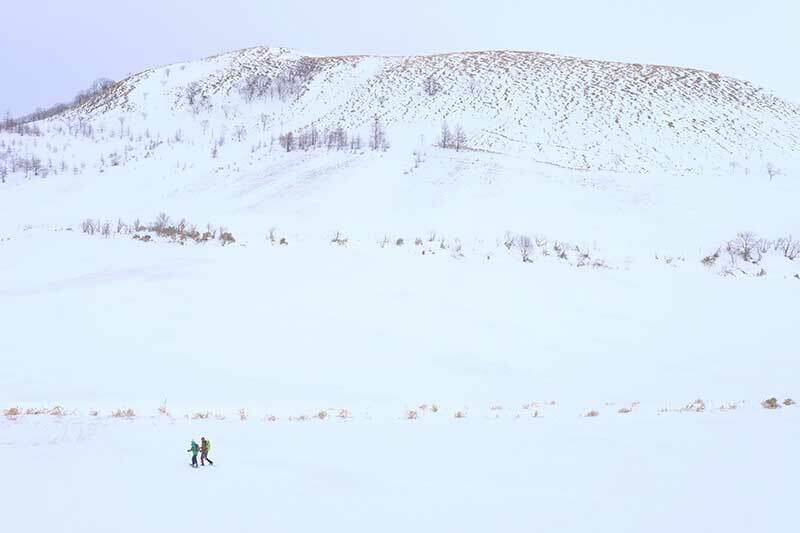 Even fewer venture onto the snow, where we often seem to be the only people for miles around. 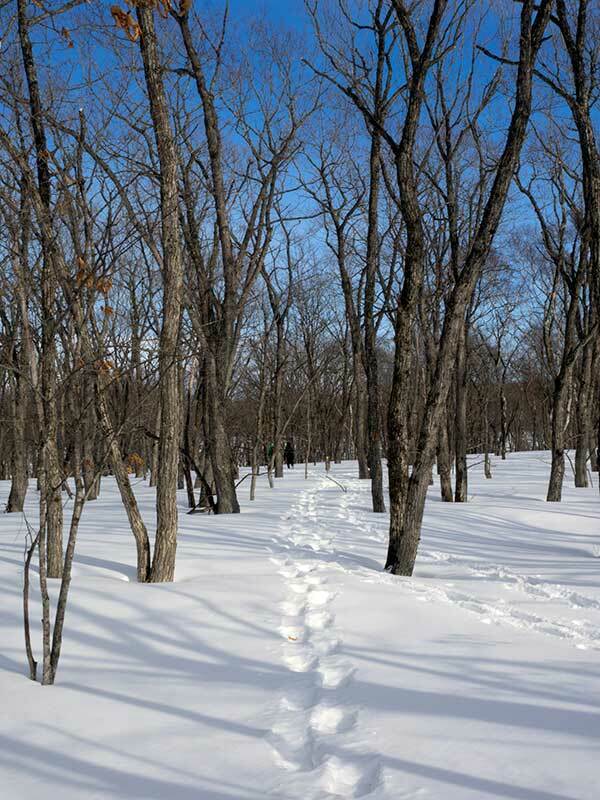 The snowy ground we explore is mostly pristine with only the footprints of the abundant wildlife, including foxes, rabbits and deer, crossing our path. Sunny weather brings crystal clear air and brilliant blue skies, which fall to a far horizon lined with the towering mountains of Hokkaido’s Daisetsuzan National Park, the Shiretoko Peninsula, or, over the Sea of Ohkotsk, the islands of Russia’s Siberian far east. In complete contrast, at other times our perspective may only reach as far as a silhouetted tree standing a few metres away. On these days we are enveloped in a quiet, intimate calmness as snow gently falls down around us. After exploring the dramatic, beautiful winter countryside, we find warm welcomes and comfortable surroundings at our accommodation. 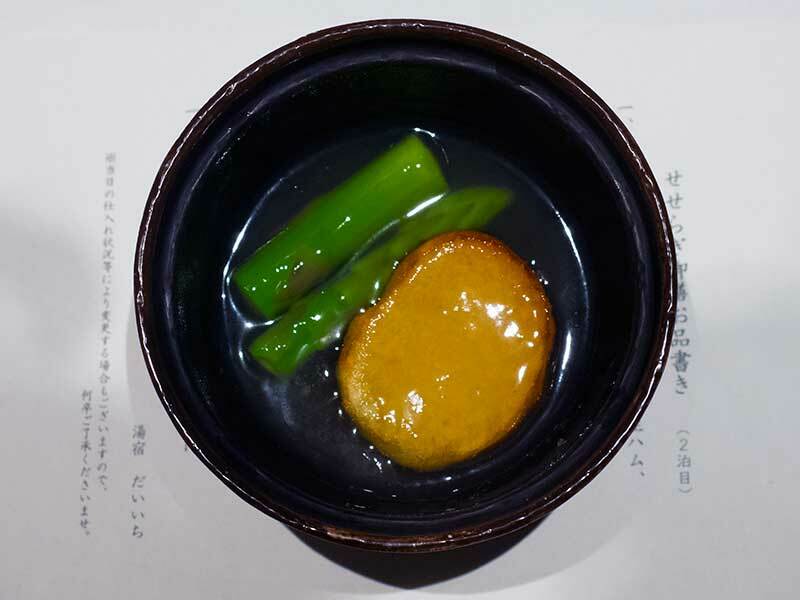 Here we satiate our palates with feasts created using some of the best seasonal range of foods found anywhere in Japan. Onsen thermal hot spring baths, another classic Japanese experience and a fine way to relax and luxuriate, are also a feature of some of the places we stay in. The tour begins at the fishing port of Kushiro. From here we use local trains, private-hire vehicles and a boat, as well as our own two feet, for a slow-paced journey over a countryside in deep winter. 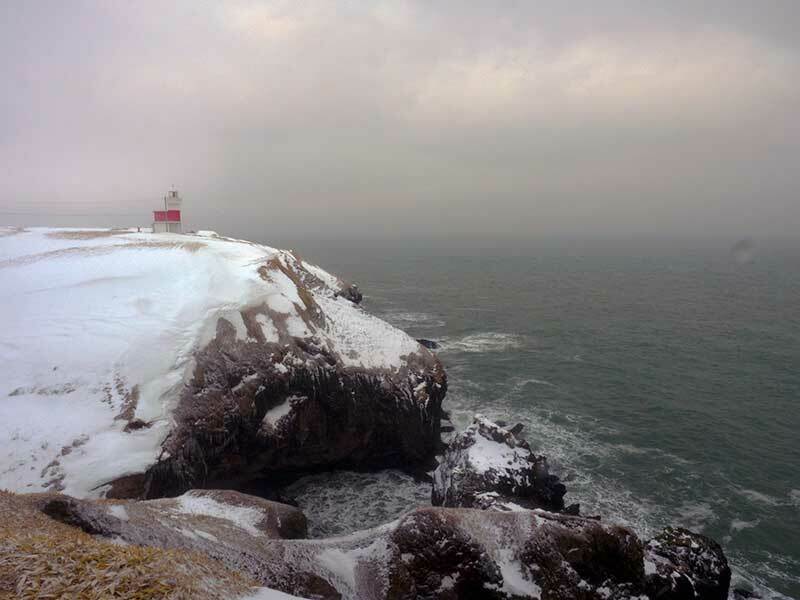 We walk over frozen seas to see fishermen bringing in the day’s catch through ice holes, through snowy landscapes past remote farmsteads, into forests and along cliff-tops overlooking the sea. En route we make time to see Hokkaido’s famed tancho red-crested cranes. Finally, we arrive in Utoro, a small onsen resort town on the coast of the Shiretoko Peninsula, which is a UNESCO World Heritage Site. 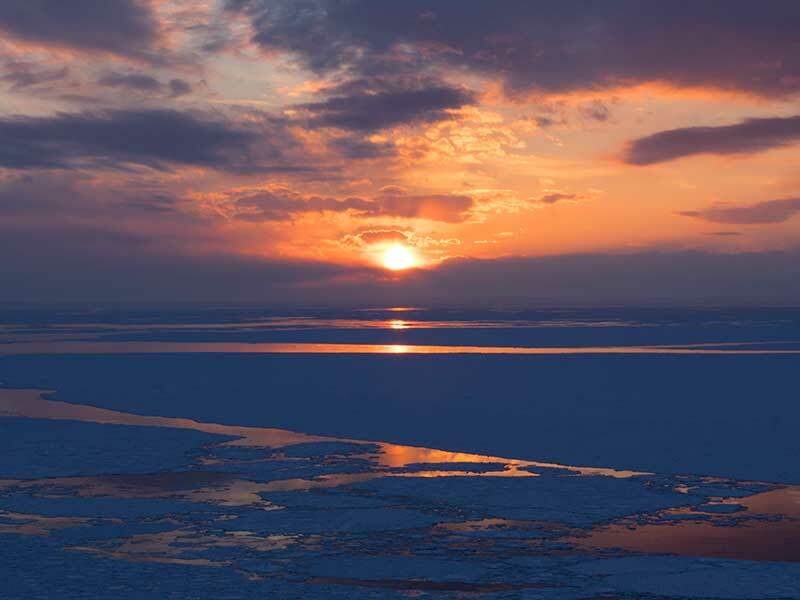 Here, the setting sun, reflected on a sea patterned with ice floes, provides us with a dramatic finale to our tour. 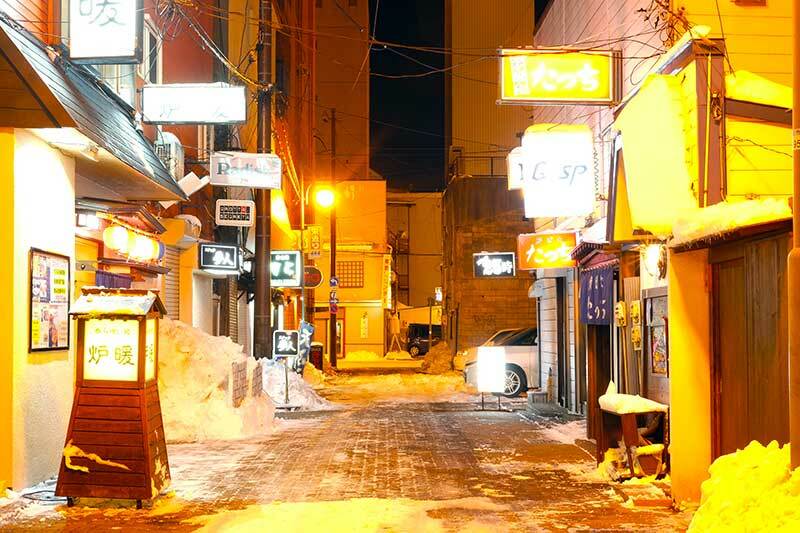 This is a gently paced walking tour, allowing us to appreciate and enjoy the highlights of Hokkaido’s eastern region in winter. The distances we cover each day are moderate, between three to six kilometres, on trails over terrain that is mostly flat or gently undulating. There are a couple of steeper climbs but these are short in duration and always taken at an easy pace. Our main baggage goes ahead by vehicle each day and we only carry what we need while walking. Throughout the tour we stay in clean, modern, comfortable Japanese inns and hotels, many with soothing onsen hot spring baths. 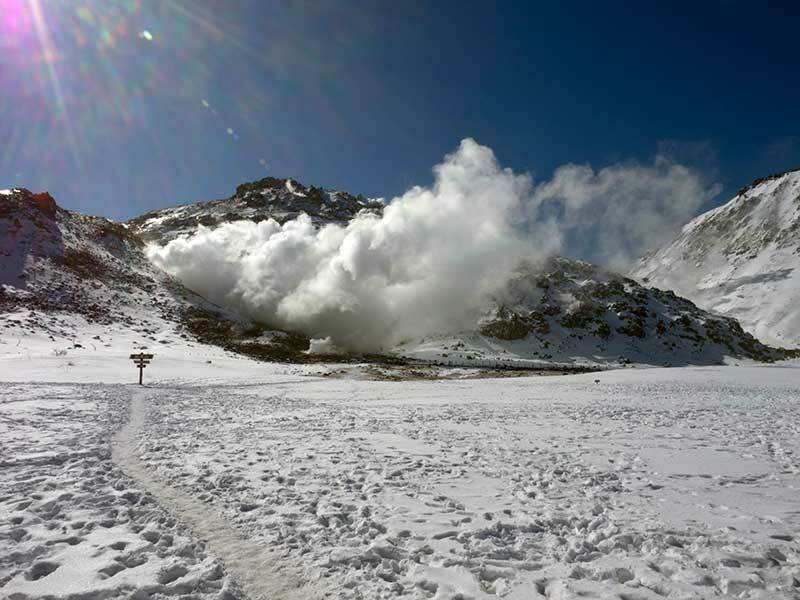 The itinerary for the Hokkaido Snow Tour is ground-only beginning in Kushiro and ending at Memanbetsu Airport. Prior to the tour, Walk Japan will provide detailed instructions for travelling to the meeting point in Kushiro from Osaka’s Kansai Airport (KIX) and Tokyo’s Narita (NRT) and Haneda (HND) Airports. Please note that at the end of the tour, travellers are advised not to book an early morning flight as it can take between two and three hours to reach Memanbetsu Airport from our accommodation. The group meets the Walk Japan tour leader in the lobby of our accommodation in Kushiro at 6pm for the tour briefing and equipment check. Dinner follows in a local restaurant. 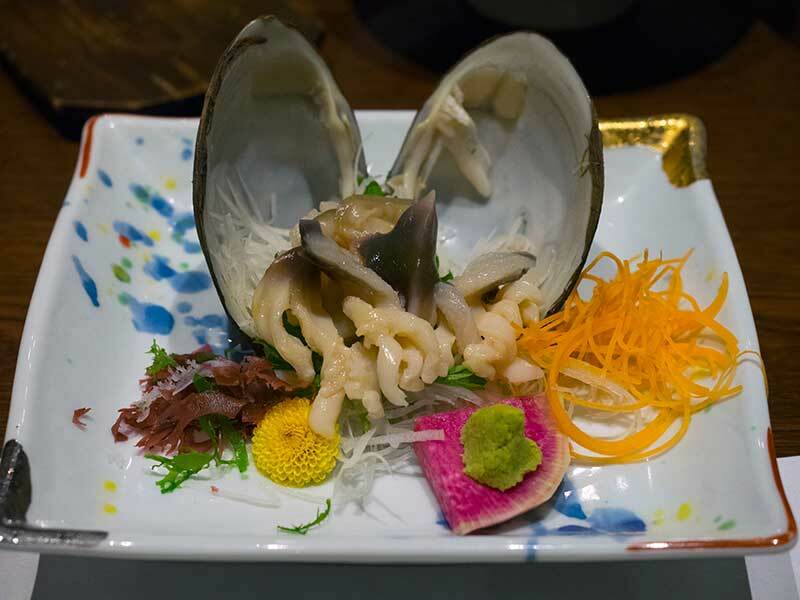 Kushiro is a major fishing port on Hokkaido’s Pacific coast and the freshest fish will be a major feature of our first meal together, and indeed of many more to come. After breakfast we transfer by vehicle to the 268.6km² Kushiro Shitsugen National Park, which is registered under the Ramsar Convention on Wetlands. The Park provides a protected habitat for wildlife and is particularly known for Hokkaido’s famed tancho red-crowned cranes. A recognised symbol of longevity and good fortune throughout East Asia, this magnificent migratory bird has been classified as critically endangered and become the focus of conservation projects in Japan. Today is an easy walk through the flat expanse of the wetland. If we are lucky, we may catch a glimpse of a tancho or two. Regardless, we will certainly see them after lunch, when we visit a centre for preserving these spectacular wild birds. Another walk through the wetlands follows before we return to our accommodation in Kushiro. With good weather, a spectacular sunset over the Pacific Ocean will begin our evening in Kushiro, where we again eat out together in town for dinner. Total elevation gain: 22m (72ft). An early breakfast so we may catch a local train to Ochiishi, a small and remote fishing village. Our train consists of a single carriage and fellow passengers include students on their way to school and locals journeying to work. 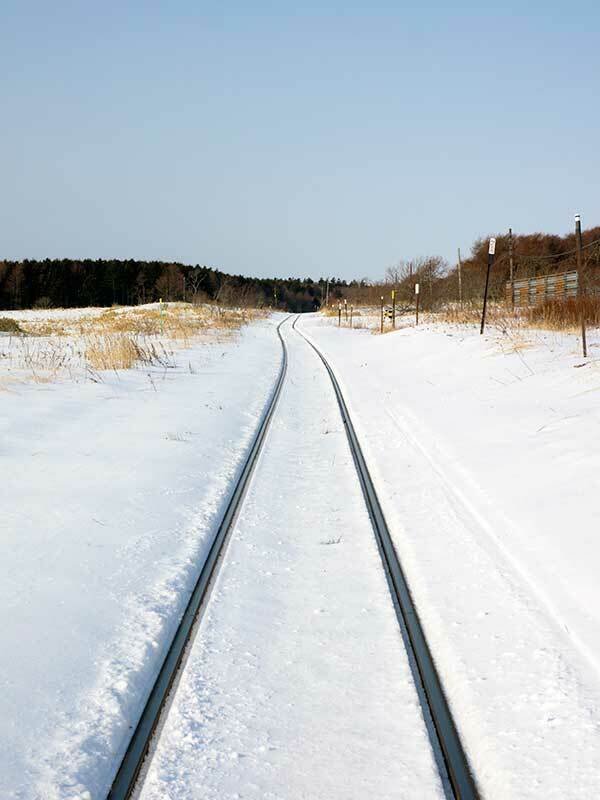 The train is a bright mark set against the wintry landscape as it makes its way, with regular tooting of its horn to warn wildlife of our approach, through remote countryside on Japan’s most easterly rail line. At Ochiishi we explore the Nemuro Peninsula, along a coastal path atop high cliffs. From here the views over the Pacific Ocean are dramatic. Our only other companions as we make our way are deer, eagles and perhaps one or two foxes. Again, weather permitting, we may see the sun set over the steely-grey sea. We enjoy our lunch of produce fresh from the surrounding seas with the locals in the tiny fishing settlement. A vehicle transfers us further east to our accommodation in Nemuro, a city founded and still reliant upon fisheries; the surrounding seas a rich feeding ground for cod, Pacific saury and squid in particular. Here the Russian-controlled Kuril Islands are close by and one, Kunashiri, can be spied on the horizon. Dinner is in our accommodation. Total walking: 7 km (4 miles). Total elevation gain: 112m (267ft). An early start after breakfast to join fishermen on the icy surface of Lake Furen-ko, a salt-water lake. We walk out over the lake, the ice crunching beneath our snowshoes, to where the fisherman break holes in the ice to access the fish. Their activities attract white-tailed eagles and Steller’s sea eagle, which we observe at a close distance. Lunch, of hearty local fare, is at a restaurant overlooking the frozen lake. A two hour drive takes us inland for our snowshoe walk to the top of Mt. Moan-yama, a hill that provides us with views over a vast landscape that has been turned over to pasture. 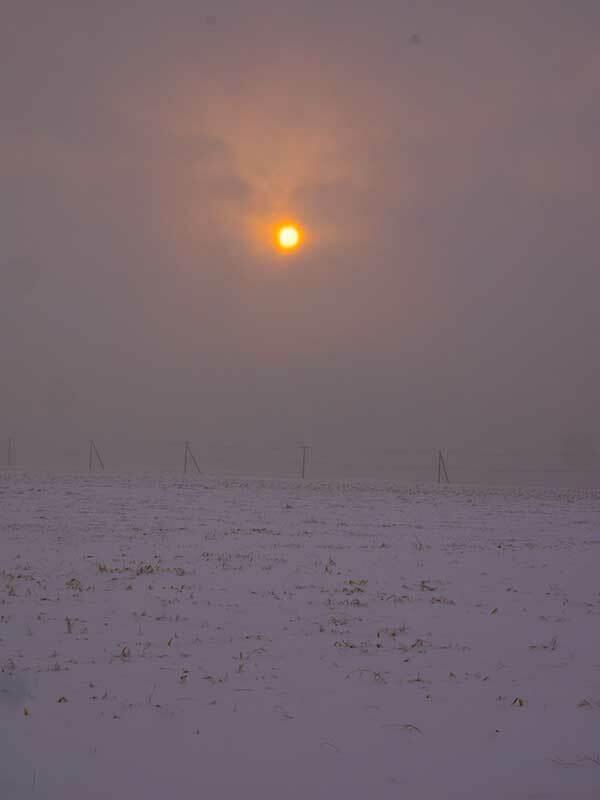 No cattle are to be seen in the snow-bound fields at this time of the year, but we may be joined on our afternoon stroll through the winter landscape by a local farmer, who relates to us how his family built their farmstead in this testing environment. He also tells us about the Ranchway, a long trail he has built through the area and which we follow in part to the top of Moan-yama. A short transfer to Yoroushi Onsen, our Japanese-style inn accommodation for the next two evenings. Yoroushi Onsen is a secluded, yet delightful place to stay. The décor of the accommodation reflects the interesting tastes of the owners, and its onsen thermal hot spring baths provide us with a soothing and relaxing way to prepare for our sumptuous dinner. Just beyond the window, wildlife, including martens, squirrels and many varieties of birds, often make an appearance. With luck, we will also see the shima-fukuro, the now rare Blakiston’s fish owl, come to feed. Accommodation: Modern Japanese-style inn with onsen hot spring baths. Total elevation gain: 109m (358ft). A buffet breakfast in our accommodation and a chance to try our hand at making mochi-tsuki pounded rice cakes. Sweetened, these provide us with delicious snacks on our adventures today. A vehicle transfers us to Lake Mashu-ko for a walk along the rim of this enormous crater lake, reputedly the clearest lake of any type in the world. On a clear day, the views across the lake to Mt. Mashu-dake are spectacular. With good reason the native Ainu peoples call the place Kamuito, or “Lake of the Gods”. We make the most of this landscape by following a hiking trail on our snowshoes along the cliff tops overlooking Mashu-ko. After lunch in a local restaurant we return to luxuriate in the comfort of our modern inn at Yoroushi Onsen. Optional further walking in the surrounding woods of our accommodation before dinner. Total elevation gain: 163m (535ft). An early morning start for transfer to the start of our climb of Mt. Mokoto-yama overlooking frozen Lake Kussharo-ko. The most testing walk of our tour but well worth the effort for the fabulous views, it provides us over Lake Kussharo-ko to Mt. O-Akan in the west and the Shiretoko Peninsula to the east. The latter is listed as a UNESCO World Heritage Site. We enjoy a well-earned lunch in nearby Kawayu Onsen town before transferring to Utoro on Shiretoko. Utoro is the main settlement on Shiretoko and also our destination for the evening. 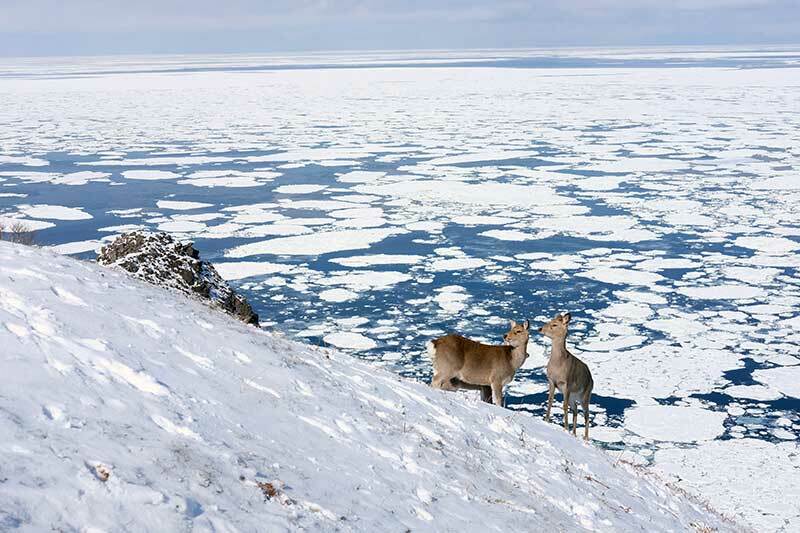 Our accommodation is a modern hotel on the edge of the Sea of Okhotsk, where ice floes wash down from Siberia and gather in the coastal waters here. Accommodation: Hotel with onsen hot spring baths. Total walking: 4.6km (2.8 miles). Total elevation gain: 245m (804ft). On our snowshoes we explore the coastal cliffs overlooking the Sea of Okhotsk. Deer roam these same cliffs with us, though they also expertly negotiate the edges of the precipices, which are most definitely a no-go area for us. 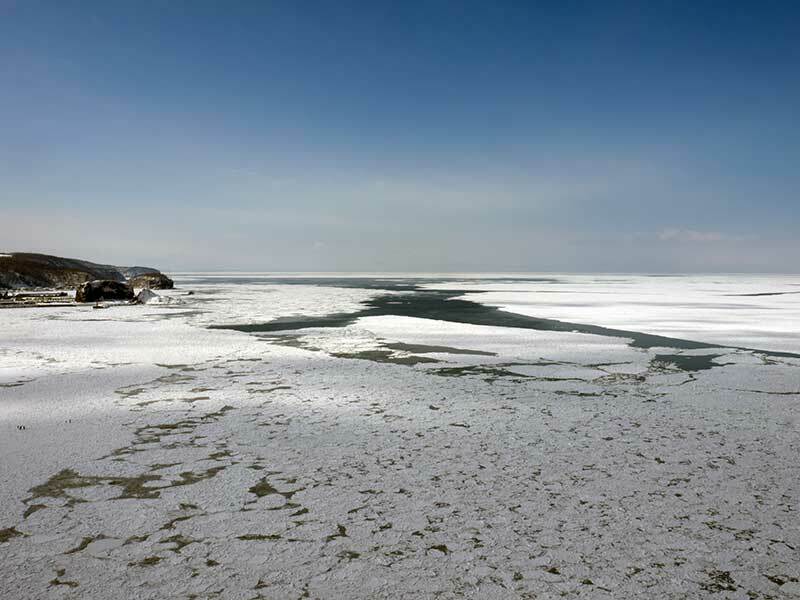 With the wind blowing in the right direction, the seas below us will be filled with the ice floes stretching to the horizon and, well beyond our view, to the island of Sakhalin, another Russian territory. Lunch is followed by our last snowshoe venture of the tour. 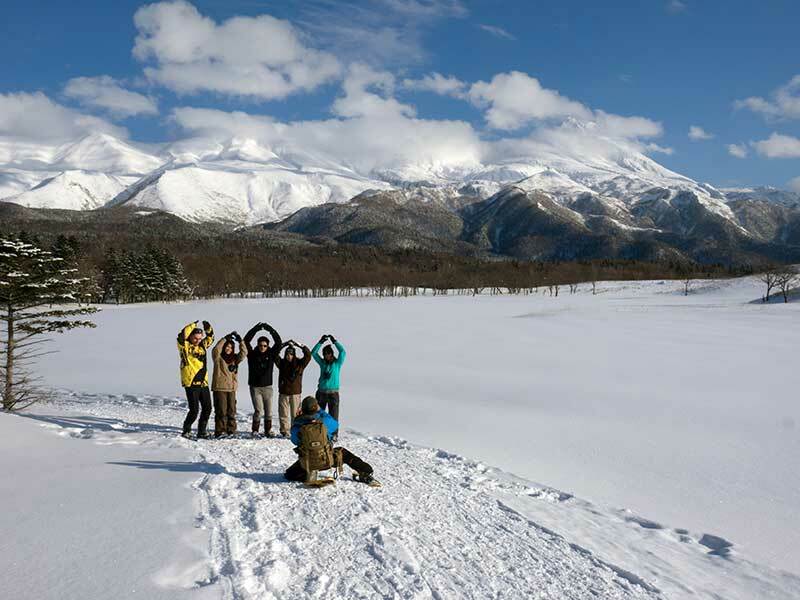 Shiretoko is known for its unspoilt wilderness and abundant wildlife, including brown bears. The bears are out of sight hibernating during our visit but we might see signs of their activity; claw marks, left by them during the warmer months on the trunks of trees. 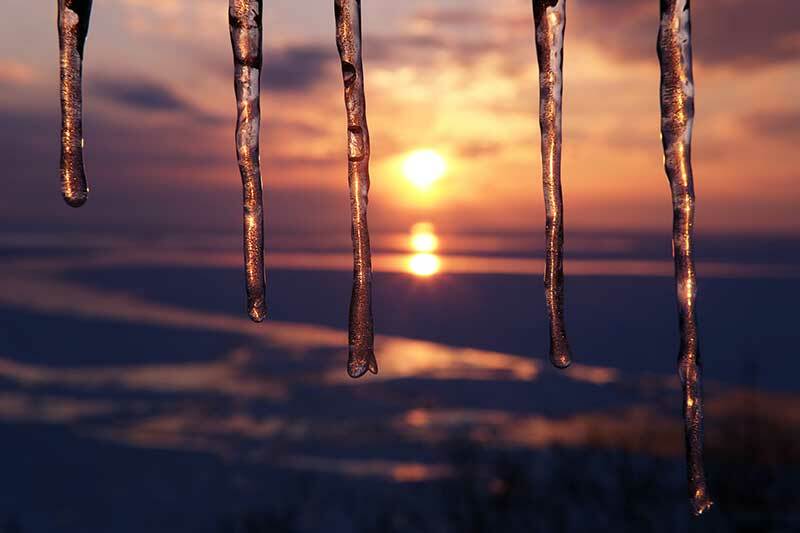 Weather willing we will enjoy a spectacular sunset over the ice floes of the seas around Utoro before we return to our accommodation for a relaxing soak in its onsen and enjoy our final dinner of the tour together. Total elevation gain: 108m (354ft). We transfer together from the accommodation to Memanbetsu Airport after breakfast, where we arrive at approximately midday. The tour ends here. If your flight requires an early departure, please contact us for advice. 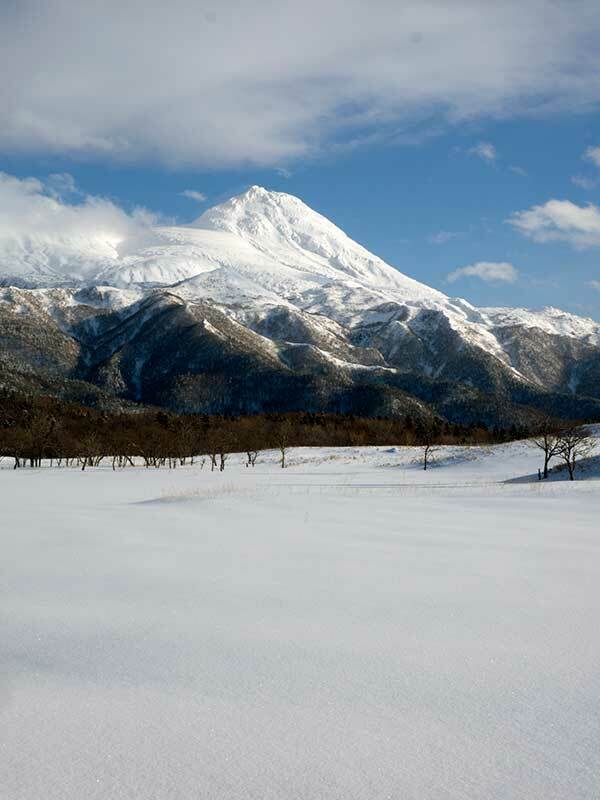 The itinerary for the Hokkaido Snow Tour is ground-only beginning in Kushiro and ending at Memanbetsu Airport. The airport closest to the tour’s start in Kushiro is Hokkaido’s Kushiro Airport, with domestic flights departing frequently from Tokyo’s Haneda International Airport. From Hokkaido’s Kushiro Airport shuttle buses depart to central Kushiro City. The journey costs about JPY940 per person and takes approximately 55 minutes. The journey by taxi costs about JPY6,000 and takes approximately 30 minutes. Tour participants are advised not to book themselves out on a morning flight from Memanbetsu Airport at the end of the tour as the group transfer will arrive at approximately midday. If you plan to depart earlier than this, please contact us for advice. 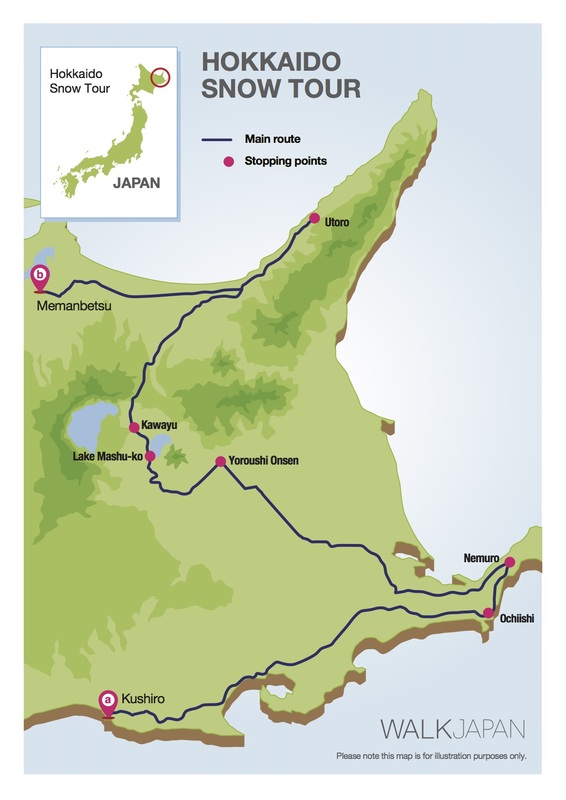 Included: Walk Japan tour leader; local support guide on 2 days; 7 nights' accommodation; 7 breakfasts, 4 lunches and 7 evening meals; snowshoe rental; dedicated support vehicle on 3 days; luggage transfers; entrance fees; travel from tour start point to tour finish point.